Stephen Riley Photography: Somerset: Café Hell?! Just how bad is the food in there?! Just putting this on here today for a bit of fun. I took this photograph on a trip to Austria a little while ago. This is in Kufstein, an alpine town in the Tyrol region, a short jaunt over the peaks from Bavaria. With its mountain-top fortress, it was a fabulous place to visit and a real treat for an architectural photographer. I’m not claiming this was the highlight of my day, from a photographic perspective, but I couldn’t resist it. 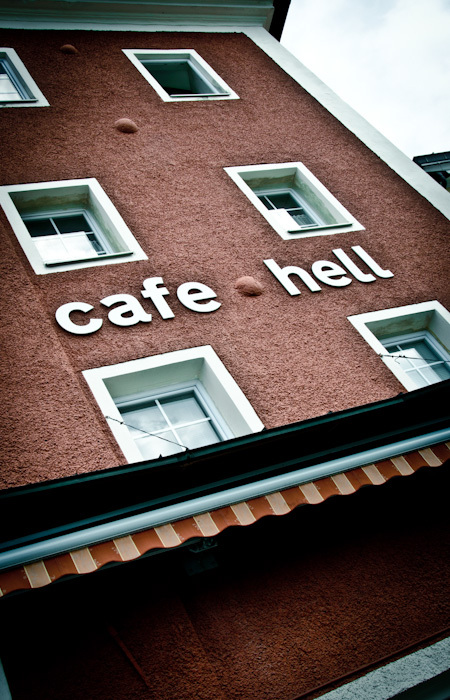 For those not au fait with the German language, ‘hell’ translates to ‘bright’, so in fact the café was selling itself as more or less the opposite of what it would appear to in English.